Summary: 12 years old Gon follows his father's steps to become a Hunter. Personal comments: This supposedly be the remake of 1999 version of Hunter x Hunter since the manga was stalled soon after the original series aired. Since I never actually saw the 1999 version, I really couldn't tell you which one is better. So far, it looks somewhat...average. But at least I get to see why this is such a hyped up series. well, i have seen the whole hunter x hunter series from 1999 (and it was damn good). I have watched the first episode of this new one and some 'problems' as risen for me. First of all it is gon's voice, it does not really fit, it also aplies for kurapika. 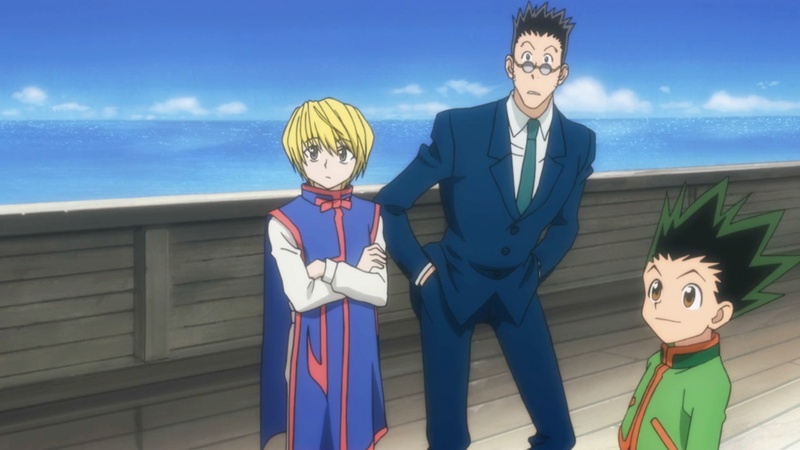 leorio (san) was the only one whose voice was true to the original. Second, I know that they are following the manga more than in 1999 but to me they like suppressed 2 episodes into 1 while completely skipping another. It is like they are scratching away the charm that the previous seasons have build up. Overall i'm not liking it, but i will watch further to see how it turns out. you can always get used to the new voices (eve though i don't want that). For now i would say that the 1999 one is far superior to this one.